SEO, PR, Social and Content often operate in silos rather than expressing an understanding that they are all critical parts of the marketing mix. They work best when each element considers the other and their common goals. At Distilled we're keen to see this change. Kristina Halvorson (CEO, Brain Traffic) is widely recognized as one of the most important voices in content strategy. She is the author of Content Strategy for the Web; the founder of the Confab content strategy conference; the host of the podcast “Content Talks”; and a sought-after speaker for conferences all over the world. Her agency Brain Traffic is home to a team of renowned content strategists, serving clients like Hewlett Packard, Coca-Cola, Merck, Amadeus, Best Buy, and Carnegie Mellon University. Kristina lives in St. Paul, Minnesota with her two kids, who often get quoted on Twitter (@halvorson). Mark: So as you know we contacted you after I spotted the post you’d written about ‘SEO and the Dirty White Lie about Content Strategy’. We've a number of questions we'd like to ask you about content strategy and the crossover with SEO. Given the overlap with other marketing disciplines, who typically owns the content strategy? Kristina: Yeah, typically nobody owns it. That’s actually something we say pretty straight forwardly in the book, there’s a whole page about marketing wants this, and the social media people want this and the legal people this, and technology wants this, and the subject matter experts want this, and the problem is that nobody owns it. And that’s a tremendous challenge and a tremendous issue, and I think there are a lot of different ways that organisations can get around that, but the first part is leadership - it all comes from leadership - because leadership has to be courageous enough to empower one person or a small team of people to say ‘NO’. Until you empower people to say 'No' to content requests or changes to site organisation or new taxonomies, it's not going to be aligned with other efforts. Somebody’s got to be able to say ‘No’. So, where do I think it should live? There’s been talk of the introduction of a new executive role called the ‘Chief Content Officer’, that acknowledges content is a business asset. I’m pretty sure Gerry McGovern first called it that (an asset) in 2007. Just like technology, just like intellectual property, just like a brand - content is a business asset. And it deserves to be considered as such. It requires strategic consideration, because otherwise it just piles up, the way that it has. Part of that, again, is having a central content strategy. Now, who should own it? That’s an enormously difficult question. The Chief Content Officer - if that can exist. I think it can live within web strategy - if there is a clear partnership with corporate communications to ensure there’s consistency between the content that’s being created both online and offline. And when I say web strategy, I’m not just talking about the website, I’m talking about all the digital content. But again, I don’t think many organisations have a web strategy team that’s truly empowered. I think they’re all answering to the Chief Marketing Officer, who is often more interested in what’s happening with mobile, or what’s happening with social media, and is not really looking at digital content efforts as one strategic initiative. M: One of the things we focus on with our clients is how do we help them get things done, and make change happen in their organisation? We don’t just want to deliver a report. We want to make sure things happen. What approaches do you take to do similar things for your clients? What do you have internally that is supporting your content efforts, or is not? Where is it that you want to be? What is that gap between where you are now and where you want to be? And what realistically are the resources that are going to help you get there? If you can really take a hard look at that, and make strategic recommendations about implementation within that reality, then stuff gets done. If you are not paying attention to how much resistance there is to change, or you’re just hoping that that resistance will go away - if you are creating initiatives that are just going to take way more resources to both launch and sustain over time - all of that stuff is setting you up for failure. And it’s that up front work - getting people to take a close, realistic look at their world of content – what impacts it internally, what’s driving it from external forces, that will then inform recommendations and a go-forward plan. That, in my opinion, is how things really get done. M: Excellent. One of the things I see when people are talking about content strategy, they very often just present a list of techniques and a list of formats. I was wondering - what does it mean to really have a strategy? K: I think what you’re talking about is people jumping directly to tactics. And the battle between strategy and tactics wages on. I try to tell people that a twitter strategy is not a strategy. Twitter is one platform, and it is a tactic to execute on your central, core content strategy. Decide on that strategy and then you decide which platforms, which channels, which people, and purposes and audiences are going to map back to that content strategy which ultimately is being fuelled by your business objectives. So, any initiative or project or program that is being put out there, we very clearly need to say, how it is helping us reach our business objectives. How is this either complimenting or competing with other program initiatives that we have? And understand very clearly that it does not live in a silo. M: I don’t know how much of an eye you keep on these things, but there have been a few significant updates in the Google algorithm recently, that are really pointing towards the need to build a solid content strategy – a lot of the old techniques are no longer working. There’s no escaping it for much longer, I don’t think. It needs to be integrated with the things that you’re talking about. K: Sadly, it is always easier for me to find companies that aren’t doing it well. I can find a LOT of companies who might be doing it well in one section of the website, but really falling down in another. I might be able to find one Twitter platform, or one Twitter account that I think is really doing a good job of representing the organisation, but then when it links me to their blog, I think that the blog is poorly executed or isn’t really targeting their user audiences. So, that is difficult for me. I can think of a couple of organisations that I always point to. One of is mayoclinic.com. They have a very very clear content strategy about who they are, who they serve, the kind of content they’re going to provide. Some of it they create themselves, some of it they specifically curate, but it is not a webMD that’s just aggregating tonnes of content from all over the place. So I admire the work they’re doing because it’s targeted, there is a solid consistency to what you find across their site. Two other organisations that get a lot of attention are Mailchimp and Zappos. Mailchimp I particularly admire because of their level of consistency. They have created something that’s really really break-through and they’ve put it online for everybody to share. And it’s voiceandtone.com - where it very clearly designs the mailchimp voice and differentiates the different tones that should be used with that voice. It’s an extraordinary case study and I think it’s very very clearly informed by an outstanding content strategy. Who else? I guess those are the ones, off of the top of my head, that I would name. M: And the other way to answer that question... who are your peers online that you look to for inspiration and ideas? K: I will say the people who have been talking about this for a long time. Anne Rockley, has been talking more about the technical side of content - how to create it in such a way that can be reused across multiple platforms, which is more relevant than ever right now. Karen McGrane has also been telling a similar story and is a terrific speaker on the topic. And is currently writing a book called ‘Content Strategy for Mobile’ that I think is going to be really popular. Katie Kiefer Lee. She’s the one who did voiceandtone.com and she’s a real leader and inspiration in the field. There are so many. Lisa Welchman does work around web strategy, and has been doing it for 15 years. I think her work is really really critical to the success of content strategy. Other people whose work has informed my work are Lou Rosenfeld, Ethan Marcotte, Luke Wroblewski, Steve Krug, Geoffrey Feldman - the usual list of players. I think on the SEO and content marketing side, I really admire the work that Anne Handley has done. I’m not that familiar - so much of SEO gets such a bad rap. So, maybe you can send me your work and I can see if you guys are somebody I can look to as a real authority. And I know you guys have a great reputation. THAT I know. M: Thank you. I actually put an email out to the company here and asked the team what questions they would like answered. And I got replies from almost every area of the company - from the blogger outreach team, the PR team, the SEO consultants, even the executive team. So it’s definitely something that we are interested in. One of the questions that came back was, how long does it take for a content strategy to reach a critical mass of traffic to their site? And the suggestion was that if people need it instantly then they would have to be looking at something like pay-per-click. And then if it was slightly longer-term, then we might be looking at things like SEO. I know it’s probably a case of 'how long is a piece of string', but how long are we talking for a content strategy to reach that critical mass? K: Well I think it depends on what you’re trying to do. I mean, it depends on what problem you’re trying to solve. The problem might be we have all these analytics for a website, we’re just not sure whether or not our metrics of success are really strictly tied to our business objectives. Or we haven’t really defined that. Well how are you going to do that and how will you overhaul your efforts in response to that? Are you talking to your users? Do you have specific user research? Are you using any kind of user personas? Are you going with keyword volume versus keyword quality? Is that you’re initiative or is your initiative to pull SEO, social media, user experience design, visual design, and marketing communications all under one umbrella so that all of your efforts can be informing the other? Is it an organisational effort? Is it a content effort? Is it a website effort? It can just really really depend, but it all comes back to what problem, or what opportunity do you see? And what is the problem you need to solve to realise it? M: So the lead-on question from that is how do you deal with clients that are very focussed on short-term wins? K: You give them to them. I think you can build the case for a larger sustainable content strategy that pulls in and allows your SEO efforts to really support and be informed by other content initiatives. But in my experience it all comes down from leadership. And leadership is often not well-informed about how things relate to one another. And they want to be able to search a certain product or search the company and see immediate results in Google. And why? This ability does not equal engagement. M: Agreed. How do you go about scaling a content strategy? That’s one thing a lot of our clients want to know. How do you start to get more results for your resources? For example, a lot of companies look to outsource a lot of their content production, because they can get more bang for their buck, in some respects. But I’m not sure that will serve all of the goals that we’ve been discussing on the call. So is there a way they can ramp up their content efforts for the resources that they have? K: Again, I go back to why? Why do you need all that content? What is it doing for your organisation? Is it supporting and driving user engagement? Is it getting in people’s way once they get to your website? Is it a topic that they are actually really interested in?Do they want that content from your organisation? How do you know that they want it? You can react to content marketing. What they’re preaching you is ‘oh, we need to be an authority, we need to deliver content in a way that this company or that company is’. You’re not Proctor and Gamble, you’re not General Mills. And they have tonnes and tonnes and tonnes of user research that they are trying to get their arms around to deliver this content. But if you are a b-to-b software company, I’m sorry, but the people that are making decisions, they might want a white paper or two, but they don’t want a huge library of content that they can spend time with. That is not how they’re going to spend their time. People are moving way too quickly. So I don’t believe that more content equals more users. I have yet to see a website outside of a media website, where all of their content does anything to engage or impress me. And that’s something that makes me crazy about content marketing. It makes me crazy. M: There was an interesting line there that I wanted to pick up on. You said, how do you know that they want it? And then you mentioned companies like Proctor and Gamble have a lot of user research. The first thing that springs to mind as an SEO would be things like keyword research. What other ways can smaller companies that aren’t Proctor and Gamble find out what content their users want? K: Well, Lou Rosenfeld wrote a book called ‘Site Search Analytics’. And it’s such a no brainer for me. It’s so amazing how few companies capture this information. But if you have an internal site search engine, are you paying attention to what people are searching for? If I know what people are searching for on the site, we can then work to identify if we have the right kinds of content to deliver to those search results. Is the content that’s coming up from those search results even relevant to it? I don’t know how many times I’ve gone into a support forum, and typed ‘reinstall software’ and come up with, ‘check out our new software installation product’, that has nothing to do with my request. Pay attention to what people are searching for once they get to your site in the first place. The second thing is talk to your sales people. Talk to the people who are actually talking to the customers. If you have a customer, before you get off the call, have two or three questions you can ask them. They will happily answer. Or where did you find us? Or was it your social media efforts? Was it your search efforts? M: The next question is something we get asked a lot. How do you approach a content strategy in a “boring industry”. K: Well, again, what are you trying to do? It doesn’t matter if it’s a boring industry. There is information that people in your industry are looking for to either support a decision or solve a problem. Going out and trying to engage someone about plumbing parts - No, that’s not what they want. They don’t want content from you. If they do want anything they want a quick ‘how to’. Or, they want a quick ‘picking the right this or that’. What is it that you want to do, and what is the problem that you’re trying to solve? I don’t think that content marketing is relevant to every single organisation. I don’t think social media is relevant to every sort of organisation. I’m sure that I would get shot down for saying that. In fact, yesterday I posted a tweet that said “social media, content marketing, SEO, blog, mobile - quit screwing around and fix your website”. And that, sometimes, is about getting all of that content out of the way. Focus on what people care about. So, what is your business objective? How is your content going to help you get that business objective and succeed at it? What is it that your user needs or wants? And how are you going to create a content strategy that bridges those two things? M: Given that we are asking this in the context of SEO, one of the problems that people will be trying to solve is that they are not ranking as high as they want to in Google. When people say content strategy they often pretty much mean a blog. And within the context of SEO this would often be for ‘linkbait’. They want people to be sharing their stuff online. So they’re not necessarily referring to their product pages and things like that, but they want their stuff to be shared online. What do you think people could do there if they feel they’re in a boring industry? How do they get people to share stuff about them? K: These questions are so hard, because they’re all so tactical. What is it that they hope to accomplish by having people share their content? I understand where they coming from, I certainly do not mean to be marginalising them, it is just a question out of context of content strategy. M: I think that this is perhaps one of the most interesting grey areas between SEO and content marketing. With SEO, what people are often trying to achieve by producing content is that if it gets shared, their site becomes more valuable in the eyes of Google, and their whole site becomes stronger and rises up the ranks across the board, not just for that page. Then they get more visits for all the keywords that they’re trying to attract visits from, that they know people are searching for. And then, once they arrive at those product pages they would look at the conversion rate optimisation and the journey the client takes there. But the reason they want their content to be shared, primarily within SEO, is because of the power of links and social shares to help the whole site become more visible. K: Got it. That gives me a lot of context, thank you. Make sure you’re serving up content that your audience want. That’s the first thing. And that includes calls. It’s talking to your sales people. At the end of a sales close, ‘what would have helped you make a decision more quickly?’ Or how can we support you now that you’re a customer. What else? Obviously social media arose from a desire to connect and share content, frankly. And so, is there content that you can publish or share with an active audience, wherever they are? If they’re looking for you on Facebook - if you find them coming to you from Facebook, that’s great. That is a great place to post content that is worth sharing. What we've found at brain traffic is part of how we’ve established ourselves as leaders in the field is that we curate really great content from other people. So we do the sharing. We say, “Hey look at this content. We think this is really great content, and we would like to share it with you”. And then, if we can somehow capture that within our own blog or our own site, that will drive people back to our blog to read our commentary. It’s almost like double-dipping. But what that does is even though we are pointing to someone else’s content, it still gives us authority. M: Considering things like the Michelin star guide, where they’re a tyre company but they’re doing stuff about restaurants... Or where you’ve got things like Red Bull media which is covering all sorts of things, is that a viable option for someone in one of these “boring industries” to be creating slightly off-topic, slightly tangential content that is in some way related to what they do or the way they brand themselves, in order to share things? K: Yes. There I guess I would point to brand, more than anything. Is that something that your brand could support? Or is it something that you want to help inform or create a new kind of brand? M: I think the branding thing makes sense. Especially if it’s not what you’re customers are specifically looking for. K: Or if it’s not necessarily how you want your customers to feel about you. I guess I can point to our organisation again. Part of our brand is that not only are we authorities on the topic of content strategy, but we also are very practical and we also like to have fun. So every once in a while we will post just a light-hearted post about something we think is funny. Or, I, as the leader of the organisation really like to use humour, whether it’s to get the point across or just to crack people up. I love laughing. So that’s part of our brand. I use twitter to crack jokes - maybe I’m the only one that’s laughing, but still. But if we are a serious content strategy firm, people thinking that we’re always posting hilarious cat videos - that’s not OK. But we’re able to strike a very nice balance that helps convey our personality. Whilst still protecting our authority on the topic. M: Excellent. Ok I’ll make this the final one. What makes the difference between good content and great content? Another thing we hear a lot of people at conferences saying is “I’ve got great content, but....”. Basically, noboby’s reading it or sharing it. You cannot force people to value what it is that you’re doing.That’s where it becomes designing things around your customers. You have to identify what it is that they value and craft your story around that. M: Excellent. That sounds like a good note to finish on. Thank you very much for your time. Is there anything in particular you’re up to at the moment that you’d like to mention? 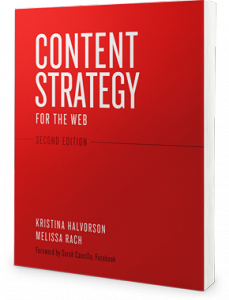 K: I think the main thing is that the second edition of ‘Content Strategy for the Web’ was released in March and it’s got a lot of new material in it around process and methodology, and new tools and case studies. What else? I don’t know, we’re just always helping clients fix their messy content problems. We are interested in working with more people who are focussing on custom publishing and content marketing, specifically because we feel strongly that SEO, social media, content marketing, and user experience considerations have all been undertaken in silos. And if they can be pulled together with a core content strategy and core objectives, we see a real opportunity there. And we’re really excited to start seeking out collaborations with clients who are ready to make that change. We’d love to get this conversation rolling. What are your thoughts on SEO and Content Strategy? Are SEOs thinking about content in the wrong way? Is there more we can be doing to merge with the larger marketing mix?